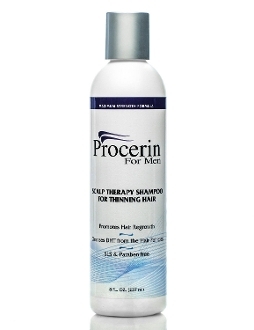 Procerin Scalp Therapy Shampoo is a scientifically developed shampoo designed specifically to fight the causes of male hair loss. Procerin Scalp Therapy Shampoo is an easy and effective way to fight male hair loss without prescription drugs or side effects. Procerin Scalp Therapy Shampoo contains naturally derived ingredients to promote a healthy scalp for hair regrowth, and powerful components to block the chemical process that causes males to lose their hair. Procerin Scalp Therapy Shampoo gently and naturally removes DHT from the scalp, allowing the hair to regrow. Procerin Shampoo contains natural ingredients to cleanse hair and promote healthy scalp for hair regrowth. It naturally and gently removes DHT from the hair follicles while cleansing the scalp. Enriched with panthenol and olive leaf extract to repair, thicken, and strengthen thinning hair! Directions: Apply a generous amount of shampoo to wet hair. Gently massage deep into the scalp and leave for several minutes before rinsing. Ingredients: Purified water, sodium olefin sufonate, sodium coco sulphate, cocamidopropyl betaine, cocamide MEA, Guar Hydroxypropyltrimonium Chloride, panthenol, olea europaea (olive) leaf extract, glycol distearate, Citrus Tangerina (tangerine) oil, citrus aurantium dulcis (orange)fragrance, phenoxyethanol, tocopherol and potassium sorbate.